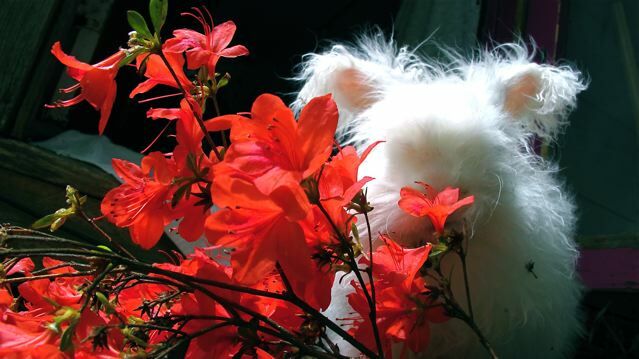 potentially nervous: nuage pauses before inhaling the azaleas. nuage pauses before inhaling the azaleas. Beautiful. Those flowers look delicious, Nuage. Are azaleas safe (nontoxic) for rabbits?? That is a stunning photograph. I love the way Nuage glows. lisa LISA! good question....i hope he enjoyed them, they won't be touching his little lips again! Tyler has eaten many popular poisonous plants he has a real genius for it. Philodendron, orchid, and apple seeds are among his favorites......also silicon muffin cups, he's like another go at one of those. That's a gorgeous photo! And good information. Mine ate a box of matches. What a relief that matches aren't on the list!